This post originally appeared in SAMHSA’s GAINS Center’s April 2016 eNewsletter. Subscribe to the GAINS Center’s eNewsletter to stay up to date on news, resources, and events. Development of a comprehensive map of how people with behavioral health conditions flow through the criminal justice system along five distinct intercept points: Law Enforcement, Initial Detention and Initial Court Hearings, Jails and Courts, Re-entry, and Community Corrections. Identification of gaps, resources, and opportunities at each intercept for individuals in the target population. Development of priorities for activities designed to improve system and service level responses for individuals in the target population. Some of the priorities that the group identified included increasing the availability of housing, expanding crisis services, and developing a cross-system data sharing system. SAMHSA’s GAINS Center recently facilitated several SIM workshops. On March 16-17, 2016, a SIM Workshop was held in Montgomery County, AL. PRA Senior Project Associates Dan Abreu and Travis Parker led the workshop, which was held at the offices of the Montgomery Area Mental Health Authority. Approximately 30 people participated in the workshop. In addition to representatives from the Montgomery Area Mental Health Authority, participants included the Healthy Minds Network, Montgomery County Sheriff’s Office, Montgomery Police Department, Montgomery County District Attorney’s Office, Montgomery County Public Defender’s Office, Montgomery Housing Authority, probation and parole officers, hospital staff, judges and court personnel, and local community organizations. For additional information, we encourage you to read an article that was published in the Montgomery Advertiser about the workshop. 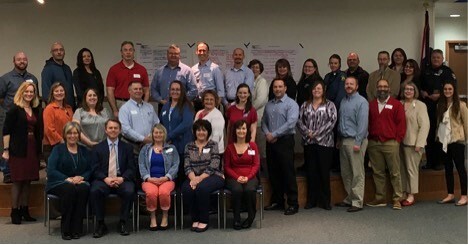 On March 22-23, 2016, a SIM Workshop was held in Pettis County, MO. PRA Senior Project Associate Travis Parker and Senior Consultant Connie Milligan led the workshop. Over 45 people participated including representatives from the Missouri Department of Mental Health, Pettis County Sheriff’s Office, Sedalia Police Department, Missouri State Highway Patrol, Montgomery County District Attorney’s Office, Montgomery County Public Defender’s Office, Sedalia Housing Authority, Social Security Administration, local legislators, probation and parole officers, hospital staff, judges and court personnel, and various treatment and service provider organizations. Some of the priorities that the group identified included establishing a crisis center where law enforcement and other crisis responders can bring people in crisis and get them connected with treatment and other services, developing mental health court, expanding diversion opportunities, and creating a community mental health liaison position to work directly people with behavioral health conditions who are involved in the criminal justice system. For additional information, we encourage you to read an article that was published in the Sedalia Democrat about the workshop. On April 12-13, 2016, a SIM Workshop was held in Craighead County, AR. PRA Senior Project Associate Travis Parker and Senior Consultant Connie Milligan led the workshop, which was held at the offices of the Mid-South Health Systems in Jonesboro, AR. Approximately 30 people participated in the workshop. In addition to representatives from the Mid-South Health Systems, participants included the Craighead County Sheriff’s Office, Craighead County Detention Center, Craighead County Public Defender’s Office, Arkansas State University, probation and parole officers, emergency services, hospital staff, judges and court personnel, and local community organizations. Some of the priorities that the group identified included establishing a crisis stabilization unit, creating shelters and other forms of emergency housing, and medication bridging. For additional information, we encourage you to check out Region 8 News’ coverage of the workshop. Following SIM workshops, the GAINS Center provides each community with a map of their criminal justice system, as well as a report that includes findings and recommendations. The GAINS Center will continue to work with additional communities in the future to help them meet the needs of people with behavioral health conditions involved with the criminal justice system.